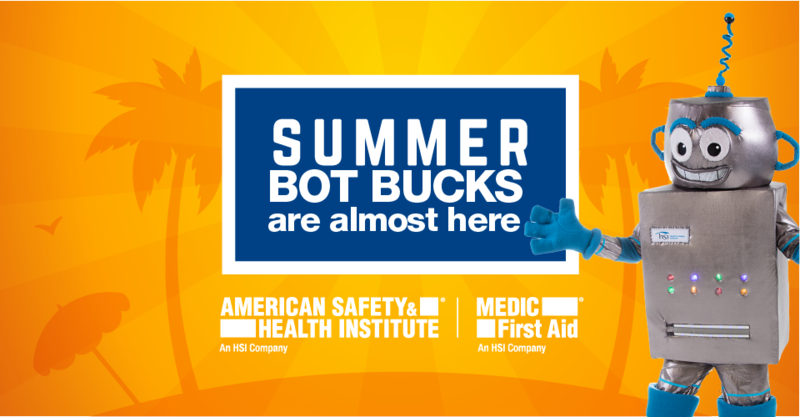 ASHI and MEDIC First Aid Training Centers can enjoy some hot summer savings during our current Bot Bucks redemption period. From July 17-28, 2017, TCs can spend their accrued Bot Bucks on student completion packs and other HSI-produced materials by using promo code BOTSUMMER17 when placing an order during the redemption period. To see how many Bot Bucks you have in your account, log in to OTIS and check out Bot Bucks Earned on your Overview tab. (To see how you accrued your Bucks, go to the Notifications tab and click See All Notifications). Not familiar with our Bot Bucks loyalty program? Click here for our program information page to learn all the ways you can accrue Bot Bucks. Thanks for being part of our ASHI and MEDIC First Aid family. We look forward to applying your Bucks to an order during this redemption cycle. You can place your order by clicking the OTIS button below or calling us at 800-447-3177. Bot Bucks accrued must be redeemed during a redemption period. If you redeem your Bucks for an order less than your accrued total, your credits will be completed--no remainder will be applied to subsequent orders. Bot Bucks cannot be used to pay for the G2015 Instructor Update Course, AEDs, manikins or other third-party products. Cannot be combined with other offers. Not applicable for shipping fees or tax. Offer valid for phone or online orders. Not available for prior purchases. Must use appropriate promo code when ordering. Bot Bucks cannot be applied to outstanding invoice balances. No cash value. Bot Bucks value reverts to 0 after the last day of the redemption period. HSI reserves the right to modify the program at any time. Additional rules apply. See our Terms and Conditions for details.